One important application of the idea that meaning is constructed by our minds and not discovered in reality is in the way it forces us to see ourselves in our constructions. The meaning we put together and project onto things is itself a symptom of our deeper insights, aspirations, ignorance, and insecurities. 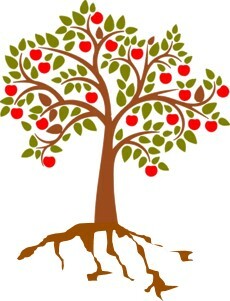 Our product reveals (and exposes) us as its creator: as Jesus said, You will know the tree by its fruit. For each of us, the most pressing and significant construction project is the construct of who we are. A constructivist psychology regards personal identity as something we piece together and put on, and it’s not a coincidence that our very word person derives from the Greek name for the mask an actor wore on stage in characterizing a role. We get our start as sentient animals, and over time we, by the instruction, support, and occasional interference of our tribe, construct a personal identity which allows us to participate in the various role plays of society. So, as with every other artifact of meaning we construct, it stands to reason that we should be able to deconstruct the person we’ve been playing on stage and mulling over in the privacy of our dressing room. Because we have pieced it together over time – or to use a different metaphor, since we have weaved this sense of who we are from threads provided to us or spun ourselves – we can also (if we so choose) delineate the pieces and unravel the strands in pursuit of a radical self-understanding. Such an endeavor is not for everyone. Many of us have installed a system of secrets, defenses, and illusions in order to maintain our identity as singular individuals, a kind of absolute and immortal unit impervious to analysis. To a person, as we might say, these individuals are working hard to hold it together, and they are afraid of learning what they’re really made of, as they are of coming apart to nothing. But as the spiritual wisdom traditions attest, coming apart to nothing is actually the path of liberation to life in its fullness. My diagram should be seen at the broadest level as a ‘T’ design, with a vertical line joined to a horizontal line at its bisected point. The horizontal line represents time, while the vertical line is structure. In what follows we will commence a deconstruction of personal identity, and you can take it as personally as you dare. At the joint of time and structure is the executive center of personality known intimately as ego, or “I-myself.” To the left, corresponding to the past, are the multiple strands going into the weave of this narrative construct of identity, the persisting form of which is called character. The farther back in time you might try to follow this narrative braid, the looser its weave becomes until the strands separate and trail off into the mists of amnesia. It’s important to understand that this fixed number of threads – think of them as minor storylines – does not exhaust the possibilities but only comprises a selection of memories and imaginings used in the construction of “my past.” The longer weave of these minor storylines constitutes your personal myth (Greek for “plot”) – the grand story and heroic adventure defining who you are. A familiar anecdote implicates character with destiny, acknowledging how your view of the future as well as the choices that co-determine your fate are in large part projections through this persistent habit of personal identity. Just as with the past, then, the future is really just “my future,” or the view of what’s ahead (so to speak) as determined by your past experiences and present beliefs. With that we will turn 90° and make our descent along the vertical line in my diagram. The first layer in the structure of identity – not first or earliest in the sequence of time, but most recent and closest to the surface – consists of those core beliefs by which you apprehend yourself, other people, life in general, and existence itself. A belief is more or less rational, even if not always or very often reasonable or realistic. In addition to its rational element, a belief carries an emotional commitment – a will and passion to take as true something that isn’t obviously so. Radical constructivism regards any and all beliefs as closures around a mystery too fluid and elusive to fully define. Words are only labels, propositions mere mental buckets you dip into the living stream, and the conclusions you draw out are curiously bucket-shaped, though you rarely give it a second thought. When it comes to your core beliefs, referring to those judgments by which you lock and stitch together the storylines of personal identity, the conclusions are so close to you, so much a part of who you are, that you can’t see the difference. Every one of your core beliefs – about “my self,” other people, and everything else – represents an emotional investment in a judgment about the way it is; or better, about the way you need it to be. The question of why you need it to be that way brings us to a deeper layer in the structure of identity. Those beliefs, remember, are only conclusions to a process transpiring farther below (and back in time). With each deeper layer you engage a more primitive, older and more basic, set of forces in the construct of self. What I name neurotic styles are six adaptive strategies by which every young child negotiates the landscape of family dysfunction in order to satisfy four subjective needs. Later in life as an adult you continue to carry your personal favorites in that complex of emotional intelligence called your Inner Child. When you get poked or hooked, or when you become stressed and exhausted, your adult controls on behavior can fall offline and your neurotic styles take over. A quick review of those subjective needs will help you, in coming back up, better understand your personal neurotic styles. Every child has a need to feel safe, loved, capable, and worthy – arising developmentally in that order. In identifying the satisfaction of these needs as a feeling, quite independent of whether it is a fact, I am qualifying what I mean by calling them subjective needs. Your reality was that the early environment of life was not perfectly safe or unconditionally loving, for no family circle is or can be. As a consequence you did your best to find satisfaction for each subjective need in the one higher up and next in line. Thus your need to feel loved was complicated by an unmet need to feel safe, and so you attached yourself to others with the expectation that they make you feel both. It is at this threshold, between your need to feel safe and loved (the security needs) and your need to feel capable and worthy (the esteem needs), that your neurotic styles were formed. As an adaptive strategy, each neurotic style is a power stratagem (a kind of ruse or trick) employed for the purpose of getting what you want; most basically, to feel safe and loved. Even when you applied your will to achievements beyond the immediate goal of feeling loved (and presumably safe), the validation of your worth in accomplishment still depended on being recognized, praised, and admired (i.e., loved) by others. The six neurotic styles that play out these power stratagems for security are listed and briefly defined below. One last step down into the structure of identity brings us to the registry of your nervous system, where the feelings of being un/safe, un/loved, in/capable, and un/worthy either allow you to relax in faith and trust, or else cause you to clutch up in anxiety and distrust. From here your body’s internal state will either invite or impede a deeper descent of awareness into what I name the grounding mystery. Passing into this deep grounding mystery is only possible to the degree you have released the construct of identity, getting over yourself and dropping the drama of being somebody for the sake of resting quietly, and anonymously, in Being itself. In the discussion around leadership, a good deal of attention is given to behavioral, ethical, and relational qualities that effective leaders possess and demonstrate. Great books and programs on excellence in leadership are abundantly available, and some of us are retrieving them from the shelves just now when good leaders seem harder to find. I recently coined a term – “Trumpence” – which I define as doing whatever it takes to put yourself first. Most of us would probably agree that putting yourself first is not the highest and surest mark of genuine leadership. What makes a leader? Are leaders made? Or is leadership more about the auspicious timing between a situational vacuum and the right set of talents, vision, courage and determination in someone who senses in it a calling to make a difference? Can a society cultivate leaders from among its membership, or does it have to wait, more or less passively, for them to rise up of their own accord? Human beings carry the genetic instructions for living creatively, courageously, and compassionately – a combination of virtues (not mere moral values but productive powers of life) that I equate with that otherwise elusive idea of the human spirit. In our nature we hold the potential to be aggressive or sympathetic, sensitive or willful, reactive or tolerant, observant or intrusive, curious or intuitive – or I should say, more or less these things, as each pair constitutes a spectrum of possibilities for expression. In this sense we might say that an individual is a ‘born leader’, meaning that he or she seems to be a product of nature, a gift for our times from the generative depths of our species. The above-named traits are not inventions of culture but endowments of nature that nevertheless can be ‘nurtured’, shaped, or suppressed by social conditioning. It’s helpful to distinguish between temperament and personality when it comes to leadership. 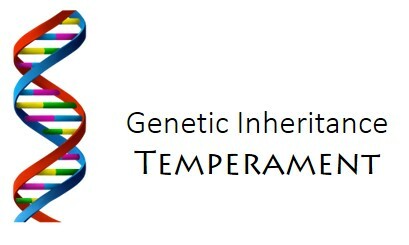 Whereas temperament refers to an individual’s genetic inheritance (the various spectra of heritable traits), personality shifts our attention to the social project of ego formation. From the Latin persona, personality refers to the unique way that one’s temperament is filtered through the restraints, bypasses, and outlets of behavior deemed appropriate by society. What we see in a newborn is not personality but temperamental expressions, and from the very beginning we are shaping what gets expressed, and how much, through the mechanisms of social feedback. Gradually what emerges from all this social conditioning is a separate center of personal identity, also known as ego. A human being has been formed into a cooperative member of the tribe, a ‘somebody’ who both fits in and stands out in appropriate degrees. As products of social engineering, leaders are fashioned and appointed to positions in society where they are needed. It stands to reason that times of strife and hardship might motivate the social selection and reinforcement of genetic traits that make for more aggressive, willful, and intrusive leaders – those who will ‘take the lead’, overcome obstacles, and defeat enemies. When they are effective and successful, we honor and celebrate them as tribal heroes. So far, we have considered two dimensions of leadership: temperament and personality, genetic inheritance and social conditioning, natural endowment and cultural instruction. A good part of the contemporary discussion on leadership stays between these two horns of ‘nature versus nurture’. Are leaders born or are they made? Both ‘born and made’ seems the right answer, but there’s another dimension we need to consider. In many posts I have argued that the formation of a separate sense of identity can either be our neurotic end or the critical passage to our fulfillment as a species. As long as ego remains inside the cage of tribal expectations and orthodox convictions, an individual cannot attain to that level of personal maturity named ego strength. This is where a stable and balanced personality, unified under the confident self-possession of a fully-formed ego, is finally capable of taking creative authority in his or her own life. Two-dimensional leaders are functionaries of the social order, performing in roles that the tribe deems necessary. They aspire to be heroes, or at least recognized by others for their praiseworthy performance. Awards, promotions, honors, and degrees are just the social conditioning they need to persist in their efforts. Many aspire to be role models for up-and-coming leaders, demonstrating excellence in their field. With the rise to creative authority, an individual begins to live out of a higher center. Not only natural endowment and cultural instruction, but self-determination increasingly becomes a driving force in how he or she lives. Before we explore what is unique to this third dimension of leadership, I need to qualify the idea of character. I am using the term in its narrative sense, as when we speak of a character in story. 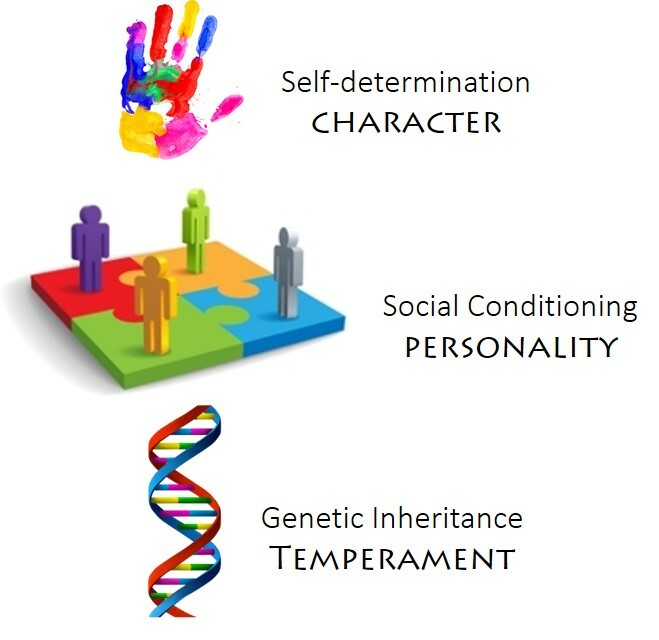 In my post Personal Myth and the Anatomy of Character I identified four traits of a strong narrative character. Grounding refers to the degree in which a character seems to belong in the narrative setting rather than hovering above or merely drifting through it. Memory is how consistent a character is through the scene sequence of a story. Integrity is a spatial equivalent to memory, referring to the way a strong character holds its identity across different situations in the narrative. And a fourth trait of character in fiction, volition, identifies the extent to which action proceeds from its own center of will instead of just happening in reaction to circumstance. Narrative characters who possess grounding, memory, integrity and volition are not only strong elements of great stories, they are what we find most interesting. What I call creative authority is essentially the ‘rights of authorship’ that an individual must eventually assume in composing his or her personal myth: a story of identity, meaning, and purpose. The developmental achievement of ego strength is the leading indicator of an individual’s readiness to assume this authority. This is the point where 3-dimensional leadership begins, as the individual makes choices, takes action, and accepts responsibility for the life he or she wants to live. We should keep in mind that just because a person may be acting in an apparently self-determined manner, a conceited, brazen, and undiplomatic character style almost always belies insecurities deeper down. Trumpence, in other words, is really an attitude of entitlement embrangled in an insatiable craving for self-importance. The counterfeit leader compensates his (or her) neurotic ego through self-inflation rather than transcending self in service to the maximal benefit of all concerned. Our times call for leaders who are 3-dimensional: human beings who are socially attuned, whose intuition of wholeness and creative courage can inspire the highest in all of us. The essential function of mythology is to link together individual consciousness (psyche; psychology) and the larger order of existence (cosmos; cosmology). Its collection of sacred stories provides the orientation, guidance, connection, and support that we need for success in the project of constructing meaning and living well. Because this project is profoundly (i.e., deeply) social, the myths were never ‘mere stories’ on the shelf for leisure reading, but great epic narratives to be recited and performed in the context of community life. That is, until fairly recently. As the advance of science inevitably altered our model of reality, the sacred myths which had draped and adorned this framework fell steadily out of relevance, and then soon afterwards, out of fashion as well. Without an alignment between our narrative constructions of mythology and our changing understanding of the universe, the sacred stories either had to be updated accordingly; discarded and forgotten; turned into allegories of hidden (metaphysical) secrets; or taken literally as journalistic accounts of supernatural revelations and miraculous events. Another option would be to more directly engage the challenge of linking consciousness and existence in order to create a relevant mythology for our time. It likely won’t be about a literal heaven and hell, but rather about outer space and inner ground, the global neighborhood and sustainable community, planetary stewardship and a more perfect union. To help in this effort, I offer an image for our consideration. 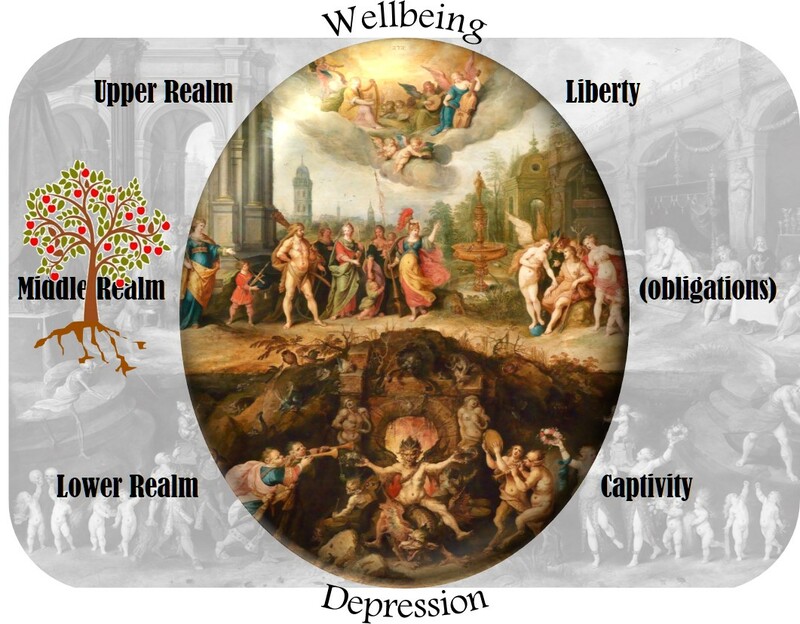 The diagram above incorporates a medieval painting of the three realms – heaven, earth, and hell – a mental model widely held throughout the ancient world as depicting the structure of reality. The specific divine, human, or demonic personalities inhabiting these three realms, along with the sacred storylines (myths) that crisscrossed and weaved them together, differed, of course, from one culture and historical period to the next. My intention is not to explore and interpret the individual myths, but only to use this structural design of three realms in a way that might contribute meaningfully to a mythology for our secular and global age. Just as the ancients understood, our experience unfolds in the middle realm of daily life. Our attention, energy, and effort get directed into those activities and concerns that conspire toward a general sense of meaning. Although we possess an animal nature in our body and its primal instincts, the special concern of human consciousness is with the affairs and challenges of our life together in community. This is where our identities are shaped and instructed with the tribe’s worldview and cache of wisdom for how to make it in the world. 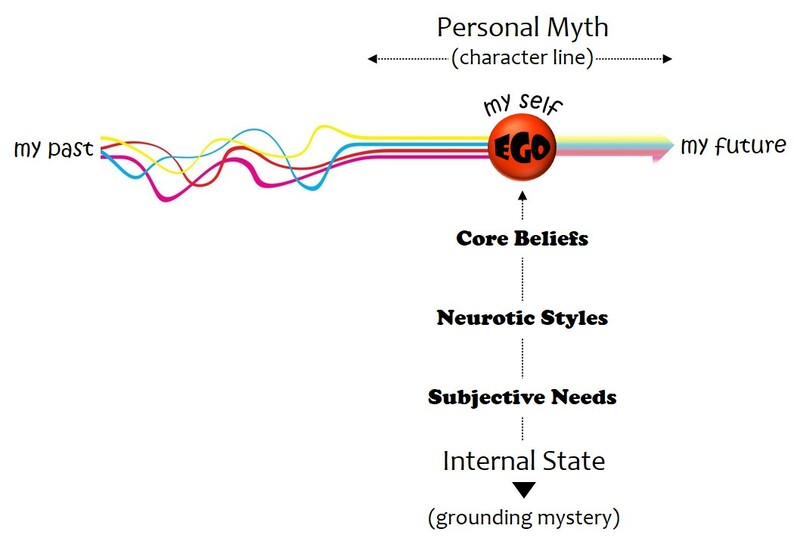 Ego consciousness – the separate center of personal identity whose dual ambition to belong and be recognized, to fit in and stand out at the same time, generates both external and internal conflicts – is thus the principal denizen of this middle realm. In another blog of mine, less philosophical and more therapeutic, I provide a simple yet highly useful schematic of 5 Domains for looking at life as a whole but also moving into the details for making the changes we desire. A recent post, titled Creators and Reactors, offered the image of a tree as a way of understanding the 5 Domains and their holistic integration. Each of the 5 Domains holds a relatively small set of basic obligations that must be fulfilled on a regular basis in order to optimize the quality of life in that domain. For example, an optimized spirituality requires that we give time to quiet reflection and finding our way to that still place at the center of our existence (which I call The Clearing) through such meditation practices as mindful breathing, contemplation, and centering prayer. A calm body and centered mind are conducive to an inner release to the grounding mystery and its ineffable intuition of oneness. Without such practices – or worse, through the uncontrolled spin-out in frantic or mindless activity – our spirituality doesn’t get the investment it needs to be the nourishing root system of our life. The middle realm, then, is where we either take responsibility for the variety of obligations across our 5 Domains, or otherwise neglect them, ignore them, avoid them, and put them off till ‘later’. But here we are: faced with the things that need our attention, standing at a ‘Y’ in our path. Depending on the choice we make at this point, our consciousness and quality of life will either shift upward or downward, into an upper realm or a lower realm, heaven or hell. Once again, I am not using these terms as references to different locations in the universe, and not even as metaphysical dimensions of reality. Instead, they are meant to indicate distinct registers of consciousness – moods, motivations, attitudes, and perspectives (in short, mindsets) – that link psyche and cosmos by very different stories and contrary mythologies. So that we can end this post on a positive note, let’s begin with the descent into hell. When we are irresponsible with the obligations of wellbeing, not taking care of the things that elevate our quality of life across the 5 Domains, our general picture begins to degenerate into something quite unpleasant. Remember those simple practices of spirituality that deepen our sense of inner peace? When we neglect or avoid them, the opposite of inner peace takes its place: insecurity. Instead of releasing our separate identity (ego) to the grounding mystery within, we desperately struggle to keep from falling into the abyss of extinction. Let’s play this all the way out. Our spiritual insecurity signals the body to release stress hormones, keeping us hypervigilant and defensive, but also suspending metabolic and immunity functions in the interest of emergency action. And when we’re all neurotic and knotted up in this way, how does it go in our relationships? Not well. We tend to be reactive, suspicious, distrustful, and self-absorbed. We also pull other equally neurotic partners into our life, forming dysfunctional and codependent attachments that serve to confirm and reinforce our general anxiety over the state of things. The problem here is that our character continues to be shaped and instructed in this negative social milieu, which means that we become takers and consumers, grasping for our share and ripping into anyone who threatens our stash. Finally, as it concerns our lifeplan and vision for the future – well, there’s just no energy or time for that. Holding off the next catastrophe has become our full-time obsession. I think that’s a pretty good description of hell, don’t you? The urgency of a life out of balance and collapsing upon itself; a hostage of our own convictions, a captive of destructive forces, bound by fear and feeling stuck in a hole that just keeps getting deeper. Hell is the deepest of all depressions. Or … we might choose the other way. Taking responsibility in the obligations of wellbeing means that we don’t wait around for someone else to live our life or save us from our problems. We do what is necessary and required in order to optimize our quality of life in all 5 Domains. We cultivate inner peace, make healthy choices, love others (even those who oppose us), serve the greater good, and relentlessly pursue a more perfect union. Heaven really isn’t that far away. Indeed it’s been right here all the time, just waiting for us to enter. As Jesus says in the Gospel of Luke, “The kingdom of God is within/among you” (Luke 17:21). All the great wisdom teachers of history are in fundamental agreement on one thing: When we know the truth, the truth will make us free. 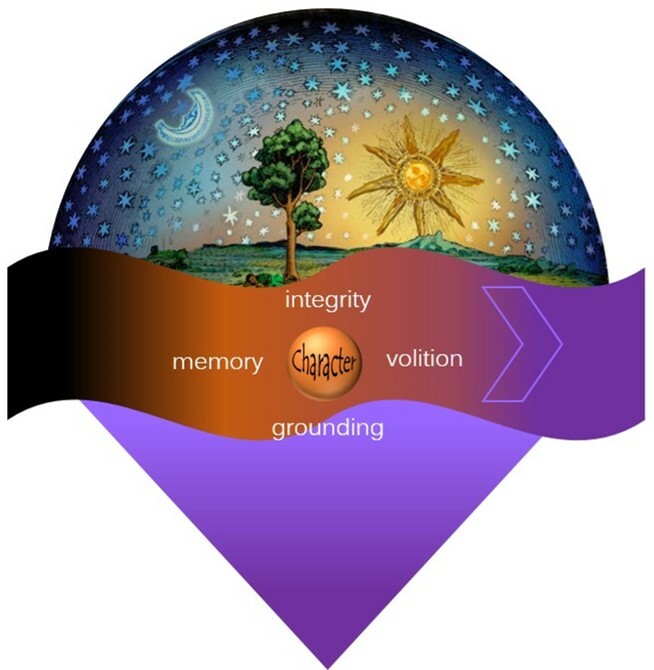 The diagram above illustrates my newly refined definition of religion, as a cultural system that links together (from the Latin religare) individual consciousness (or psychology, represented in the purple triangle) and the larger order of existence (or cosmology, represented in the dome overhead) by means of sacred stories (or mythology, represented in the moving wave between them) that serve to orient us in space, guide us through time, connect us to one another, and support us across the adventure of life. Once again, I am speaking here of religion itself, not necessarily of this or that religion, numerous examples of which have indeed lost this unifying function and fallen out of relevance in our day. I’ve explored in other posts what happens when religions misread their myths by taking them literally, defend outdated models of reality, and neglect (or even condemn) the inner depths of mystical awareness. They die, but continue on in fundamentalist orthodoxies, megachurch celebrity cults, metaphysical roadshows, or militant end-time sects. Effective and relevant religion will provide the orientation, guidance, connection, and support that individuals and communities require throughout the full course of human development. Ultimately this will also include breakthrough realizations of a ‘truth beyond’ our conventional beliefs, and of a ‘power within’, deeper even than that cherished center of personal identity (i.e., ego) which religion itself (as theism) had earlier made the focus of salvation. This post-theist excursion into a more experiential, communitarian, and globally-minded spirituality is where the evolutionary design of our human nature is headed. In a recent post I suggested that the narrative device of Apocalypse, which can be found in all developed mythologies, is not referring to a future cataclysm of world-collapse, but instead represents a self-conscious awareness inside the mythopoetic (storytelling) process itself, of their status as sacred fictions. Outside these narrative constructions of meaning is the present mystery of reality, the terminal end of our stories and thus of the storied world itself. If mythology has done its work – referring to the orienting, guiding, connecting, and supporting functions mentioned earlier – then we are ready for a psychological breakthrough to a more rational, responsible, and reality-oriented way of life. My term for this liberated mode of experience is ‘creative authority’: when the individual not only sees through the constructions that had earlier draped both reality and consciousness with veils of meaning, but goes on to take responsibility as the principal author of his or her own personal myth and its associated world. If it sounds like we’re returning to life under the shroud, I must emphasize the key insight of this breakthrough realization, which is that the individual is now a self-conscious storyteller. In other words, we have entered the ‘ironic mode’ (Northrup Frye) where the storyteller is aware of the fact that he or she is spinning narratives across a mystery that cannot be named. This brings us to the interesting challenge of composing our own personal myth. The art of storytelling (or myth-making) is millenniums old, which means that we have a vast library and useful tools at our disposal for the project before us. In this post I want to reflect on the features of well-developed character, using this term in its literary and not so much its moral (or moralistic) sense. A character is thus a narrative personification, an identity in story who strives (Greek agon) for (as protagonist) and against (as antagonist) the plot in its unfolding. A ‘good’ character (again, not in the moral sense) is one that evinces certain traits and makes the story particularly interesting. Our work as self-conscious storytellers of our own personal myths will involve constructing an identity for ourselves that possesses four traits in particular: memory, integrity, grounding, and volition. In any good story, character is an identity that becomes stronger (i.e., more definite and self-consistent) over time. A character’s memory has to do with how recognizable it is with respect to what we’ve already come to know about him or her in the story up to this point. The story’s audience starts to anticipate how a character will respond by virtue of how he or she behaved in similar scenes or challenges earlier in the narrative. With growing confidence in a character’s memory, they are better able to trust his or her performance. As we take responsibility for the construction and management of our personal identity, each of us should consider the fidelity of our character to the person we have been. This is not to suggest that we simply repeat the mistakes of our past, or that spontaneity and fresh departures are out of the question. Even if we should undergo a conversion of some sort, the memory of character will deepen our understanding and empathy for others, adding dimension and complexity to the person we are. This is an aspect of what is known as wisdom. Alternatively, neglecting the character trait of memory can make us insensitive to others, even projecting on them the dark energies of our own repressed and forgotten shadow. If the character trait of memory is what establishes consistency through time, then integrity is about consistency across space, or across the landscape of life situations and social engagements. A narrative character who changes dramatically from one engagement to another leaves the audience unsure as to ‘who’ will show up next. In psychology this lack of consistency across situations is evidence of ‘dissociative identity’ (formerly ‘multiple personality’), where a personality lacks sufficient ego strength to coordinate and unify otherwise diverging streams of subconscious motivation and demeanor. In the early years of ego formation when we were being shaped, instructed, and managed by our tribe into a compliant member of the group, identity contracts dictated our role in each social situation. Now, stepping through the Apocalypse and into our own creative authority, we can take ‘authorial control’ over the person we want to be. We can join the role-play, fully aware that it is just a social convention in make-believe. Or we might take a stand for a more authentic, self-honest, re-imagined and creative way of being together. This is what Jesus called the kingdom of God. A ‘grounded’ character in story doesn’t simply drift above the moving scenes, essentially detached from the situational dynamics of time and setting. He or she has the feel of belonging, of being rooted in that narrative world and not just an alien passing through. In this sense the story isn’t merely ‘about’ the character, but unfolds around and through the character’s individual evolution. My returning reader will recognize this idea of grounding from my frequent references to ‘the grounding mystery’, that inner depth of spiritual life where our personal identity sinks and dissolves into an ineffable sense of being. Of course, if ego is caught in a neurotic tangle of insecurity and self-defense, any suggestion of sinking and dissolving into something else will be vigorously resisted, and inevitably misunderstood. Creative authority requires that we ‘loosen up’ and release ourselves to the deeper process, so that we can carry that ‘power within’ into the affairs of our daily life in the world. Our fourth and final character trait picks up with that last sentence – as we take action and work out the evolving plot of our personal myth. In story, the action of a ‘weak’ character will be determined by external events and circumstances, whereas a ‘strong’ character chooses and determines it for him- or herself. Volition (from the Latin vol for will) is about a character taking action rather than reacting, moved by an internal drive or desire. The better stories in mythology, literature, film, and stage are those that are driven by strong characters whose action seems to proceed from their center. As we break through from a mode of role performance (acting out the instructions and expectations of our tribe) to one of role transcendence (using our role in a more purposeful and creative way), we are able to construct a personal myth that supports the life and genuine community we really want. We don’t pick up a mask of identity (a persona) because someone else tells us to, because a tradition (or consensus trance) calls for it. We can live out of our own center, for values and aims that others might not find agreeable. Our action is not about defiance or transgression, but instead arches toward a deeper, higher, or longer goal. More and more of us are ready for the responsibility of writing our own story, of composing our own personal myth. Our tribe and culture have done their part, for better or worse, and now it’s our turn. We have finally come to realize that our identities and the worlds we inhabit are really nothing more than narrative constructions, meaningful fictions of our personal and interpersonal life. It is time to step into our own creative authority, take leave of the gods, and become fully human. This is life after the Apocalypse. Nature took a huge risk in giving our species self-control and free will. Of course, I need to qualify these terms right away, as our self-control and free will are really quite limited. But the degree in which we have these is behind most of what today we celebrate (and sometimes regret) as our distinctly human contribution to life on this planet. When in our prehistory this endowment occurred is impossible to say, but if our individual development through the lifespan recapitulates the timing and sequence of our evolution as a species, then we can confidently say that it began early. In all honesty we have to admit that it’s probably still in process, seeing as how so much of our tribulation along with the collateral damage we are causing is a consequence of our immaturity and neurotic hangups around self-control and free will. Self-control achieves a liberation of creative energy from the compulsive drives and reflexes of instinct, while free will invites the question of how this creative energy will be otherwise invested. The beneficiary (and executor-in-training) of this endowment is that peculiar little miracle called the ego. For thousands and perhaps millions of years, the human body and soul have changed very little. The outward orientation of consciousness to its surroundings and the inward orientation to its own grounding mystery are essentially the same today as they were at the dawn of our history. The difference – and the difference-maker – across that great span of time has been this center of self-conscious identity: the “I” (ego). As I said, although it may have begun to appear many millenniums ago – in the “childhood” of our species – we are at present certainly farther along but (just as certainly) significantly short of where we need to be. Nature’s gamble is still in play. It’s reasonable to assume that our evolutionary progress as a species advances according to how far we are individually able to develop and use our creative energy for the greater good. Our individual hangups may hinder human progress more than we realize or want to admit. My diagram above illustrates the timing and sequence of human development as it tracks with the formation of ego consciousness. The arcing magenta-colored arrow represents the lifespan, which I’ve divided into four periods – the early life of a Child, followed by the age of Youth, maturing into a longer period of an Adult, and culminating in the late life of an Elder. Before I dig deeper into each of these four periods, let’s stay at this level of resolution and think about the major ideas carried in my diagram: Ground, Character, and Destiny. Character is first of all a literary term referring to personalities (human or otherwise) that are introduced and developed in stories. At first introduction a literary figure is a cosmetic placeholder, just a name filled in with the bare details we need to know as an audience. As the story progresses we are given more information and observe this personality in various situations of challenge, agency, and reaction. Over time (which means farther along the narrative) the figure takes on weight and consistency, to the extent that we can reasonably predict how he or she will behave next. That’s what I mean by character: the habit of identity that accumulates around individuals as they follow their inclinations (or restrain them), respond to their circumstances (or hide from them), and choose their path through life (or look for excuses). The one doing all of this is ego, which makes character the “weight and consistency” that determines identity as time goes on. I’ve tried to illustrate this increasing influence of character on identity by the color gradient of the word (getting darker and heavier from left to right). Destiny refers to the culmination of development, to what I have elsewhere called the “apotheosis” of the individual and evolutionary fulfillment of our species. Its most important meaning is subjective – that is to say, the clarity of vision that individuals, communities, or even entire generations have concerning the longer purpose of their existence. The color gradient of this word is also intended to suggest that this future vision becomes more vivid and attractive with the formation of character. The third big idea represented in my diagram is Ground, which should be familiar to my readers. Ground is not some thing, but the generative source and support of all things; it is being-itself. Also called the grounding mystery, it’s the internal wellspring of existence accessible only by the descending path of introspective meditation. Even though it’s the best and most widely used metaphor for this mystery, “ground” is still only a conceptual qualification for what cannot be named or known. This ineffable nature of the grounding mystery makes it a limitless source of inspiration, which helps to explain the lush variety of mythopoetic depictions of God across the world religions. But let’s come back to character, as it’s really the central idea of my diagram. Our evolutionary endowment of self-control and free will tracks with the gradual ascent of ego consciousness, as the individual increasingly becomes a “separate” center of identity. I put that word in quotes to remind us that separateness, along with the associated delusion of independence, is really only an apparent separateness (and independence) and is itself dependent on a crisscrossing system of suspension wires called agreements or beliefs. In other words, who (we think) we are is nothing more than a function of what we attach ourselves to or push away from, constituting an “identity contract” that characterizes us (literally) as “for” this or “against” that. The identity contract itself will record various subsets of attitudes, behaviors, expectations, and responsibilities that fill out what a given role entails. As we advance along the arc of our lifespan we are taking on additional identity contracts, even as we step out of others and leave them behind. The more defined our identity is, the stronger our character is, since character is nothing but the “weight and consistency” that identity accumulates in the process of becoming somebody (ego). On balance, the older we are the more identity contracts we are likely to hold. A newborn baby has no ego as yet, but soon enough she will begin taking on agreements and entering identity contracts with the powers that be. The formation of character is thus a life-long project. But this project doesn’t proceed in a haphazard manner; we don’t simply take on identity contracts at random. Instead I will suggest that the arc of ego development moves through distinct evolutionary fields that coincide roughly with chronological periods of time – the four ages of the Child, the Youth, the Adult, and the Elder. The age thresholds indicated in the diagram (10, 25, 60) shouldn’t be taken as hard predictors, but rather as average ages at which an individual is likely to cross over from one major period (or evolutionary field) to the next. Each age is oriented on an existential concern, which in a previous post (“Myth and the Matrix of Meaning”: http://wp.me/p2tkek-j2) I named a primary concern that acts as a magnetic attractor of values and interests. Now I can place these primary or existential concerns in the developmental context of an individual lifespan, specifically in this chronological order: security (Child), freedom (Youth), suffering (Adult), and fate (Elder). I’m not suggesting that this is the only thing an individual thinks about or dwells on in a given period. Obviously there is much else going on. The point, however, is that each existential concern – even if not explicitly registered in consciousness – pulls all other values into its gravity. The remaining components of my diagram are “mood” (at the deep center) and four literary modes, or types of story (along the periphery of the arc). I am borrowing these modes from the work of Northrup Frye, a giant in twentieth-century literary criticism. Mood is a kind of mode in its own right, referring to the physical-emotional state of the nervous system persisting over time. Our experience of life is profoundly conditioned (filtered, shaped, limited, and oriented) by our prevailing mood, which is how provident we feel reality is as it concerns our security, freedom, suffering, and fate. The ideal physical-emotional state is what we might name confidence (or faith), an inner assurance that the present mystery of reality supports us in our need. Just as a comedy isn’t necessarily “comical,” a romance isn’t always “romantic” in the sappy sense. As a literary mode, romance is a story about freedom (adventure, risk, discovery, inspiration), the trials that wait beyond the horizon, and the validation of desire for a worthy ideal. Romance has an obvious correlation to the age of Youth, when an individual typically grows bored with the current world-order and pushes the boundaries of fashion, propriety, safety, and moral permission. To associate adulthood with suffering and tragedy should elicit protest – but maybe not from adults themselves. The plot-curve of tragedy trends in a definite downward direction, engaging along the way in experiences of suffering (pain, obligation, sacrifice, loss), typically without an upward reversal of fortune to make it all better. The Buddha’s dictum that “life is suffering” rings true for many adults who have to learn the art of living with pain, of reconciling their youthful dreams to actual achievement, and carrying on after the loss of friends, employment, or aging parents. As an individual progresses into the age of an Elder, the boundaries of what is possible begin to collapse more closely to the limits of reality. Since one’s character is largely the product of all that’s happened, of all the choices made, of the way things just happened to shake out, is it a fallacy to believe that all of it is as it had to be? What good is wishing it had been otherwise? In the greater scheme of things there may be limits and necessities that ultimately call the shots – what the ancients called fate. The literary mode of irony provides a double vision on the narrative, where the self-control and free will of its characters are contained and determined by the story itself. Just as in real life, the last period on the final sentence brings everything to an end. Now, while that seems like a needlessly pessimistic note to end on, let’s remember that wisdom – the esteemed virtue of later life – is an understanding of how to live in harmony with the greater rhythms, higher wholeness, present mystery, and terminal conditions of our life in time. Before we shuttle our elders off to nursing homes, we might honor their lives and really listen to their stories. Nietzsche’s “will to power” has been taken as a ruthless pursuit of superiority, as the drive to overcome, dominate and subdue others. It’s probably this idea of his, more than any other, that encouraged many to see in Nietzsche a kind of pre-endorsement of fascism and inspiration of Hitler. But, once again, this represents a gross mis-reading of Nietzsche. True enough, he was scathingly critical of those Christian utopians who foretold a future where all people would live in happy equality and perpetual peace. What would happen if we smoothed down all differences, every more-or-less, and were able to remove the friction, tension and conflict that characterize so much of our interpersonal relations? Nietzsche was not a fan of equality – or democracy, insofar as it insists on the principle that everyone is equal. He even seems here to affirm and encourage exploitation. Isn’t that evidence enough that Nietzsche is against Christian morality. Oh right, we already determined that. But against moral decency? Ah, true again. He’s a “nihilist,” then, a moral anarchist, proto-Nazi and antichrist. Well, not really. The straightforward definition of exploitation is based on the verb exploit, which simply means “to utilize, advance or promote.” Granted, it’s more about your advancement than someone else’s, but that doesn’t have to make it greedy or vicious. Perhaps we’re dealing here with something more analogue than digital, a variable range from too little to too much, rather than a simple “on” or “off.” The Christian morality that Nietzsche was reacting to tended (and still tends) to be digital – it’s either a virtue or a vice, praiseworthy or condemnable. Such a digital value system plays out and produces a dualistic worldview (good versus evil) as well as bipolar personalities that are unable to absorb and modulate the emotional complexity of experience. Is a healthy human society entirely free of exploitation, competition and self-interest? The early Christian communalism as described in the New Testament Acts of the Apostles is frequently referenced as an ideal, and we know that Karl Marx envisioned a society where every talent would be harnessed, every need satisfied. But that was a fantasy. In the meantime, exploited proletarians need to muster themselves and pull down the bourgeoisie system of privilege. Sounds like exploitation just running in the opposite direction, doesn’t it? And what about those primitive Christians? That model quickly fell apart as real life seeped in and a politics of entitlement took over. Exactly, Nietzsche would say. The drive to utilize resources, advance the quality of life, and promote the fulfillment of its own deeper nature is written into the genetic code of life itself. Efforts to push it down and put it out are really just another form of exploitation, which prompts the question of whose interests are being served in our moral repression. The “will to life” naturally arises in every living thing as it seeks its own foothold in the universe, struggles to satisfy its basic needs, and strives to actualize its true nature. If we should remove all obstacles and flatten out all uprisings; if we could somehow assuage every hint of discontent and anesthetize the energizing nerve of our innate selfishness – would the result be a healthy society and genuine community? No. Instead we would end up with such an inertia of mediocrity and laziness, that our very survival would be in jeopardy. Nietzsche wasn’t in support of pushing down your neighbor and sticking it to the poor. His ideal was not just another aristocracy based on the golden rule of a rogue capitalism – “The one with the gold rules.” Nor was he an advocate of a ruthless antagonism where individuals and classes are consumed in their schemes to ruin each other. He believed that our better days are still ahead, but not in a utopia where everyone is equal and all adversities have been neutralized. We need to get along, but each of us must also get along – that is, we need to go forward in our own development and evolution as human beings. An important part of that development involves our relationships with others in society, but we must be careful not to cut the root as we cultivate the flower. An illustration from the vineyard. Vines that are grown in super-rich soil where every emergent need of the plant is instantly and abundantly provided for don’t have to “strive” as diligently to produce fruit. As a consequence of this “privilege,” the vines will put out lazy grapes – berries that are bloated and tasteless, lacking in complexity and depth. Wine made from lazy grapes is characteristically flat and uninteresting, winding up as cheap jug wine. The overly providential vintner, by removing adverse conditions and anticipating every need, thereby enfeebles the plant’s innate “will to power” and compromises its natural intelligence. Nietzsche might say that our culture is bringing forth “lazy grapes,” individuals lacking the complexity of character, inner fortitude and passion for life that our species requires for the next phase in our evolution. Though he waxed prophetic over the “superman” (Ubermensch) of the future, this apparent recession of the human spirit made him wonder whether our opportunity has already passed.